In June 1942 members of the French Resis­tance pro­vided British intel­li­gence with a copy of the top-secret blue­print of portions of Adolf Hitler’s Atlan­tic Wall—part of the defenses against the anti­ci­pated Allied in­va­sion of West­ern Europe. The map had been spirited from the office of the Ger­man public works bureau that was building the coastal defenses, and it revealed the strong and the weak points along the entire North­western French coast of Normandy, from Cherbourg in the west almost to Le Havre in the east. The French Resis­tance con­tinued to pass the Allies detailed infor­ma­tion about the Nor­man­dy in­va­sion area right up to D-Day—infor­ma­tion pro­vided in part by some of the thou­sands of French laborers and Ital­ian POWs Field Marshal Erwin Rom­mel (he of Afrika Korps fame) was using to build stronger coastal defenses, plant thou­sands upon thou­sands of land mines, flood large areas behind the flat beaches to drown Allied para­troopers, and drive long poles called “Rom­mel’s aspa­ragus” into open fields to thwart the safe landing of Allied troop gliders. In advance of Oper­a­tion Over­lord, the code­name for the June 1944 Nor­mandy landings, Allied air­craft began pounding syn­the­tic oil plants in Ger­many, which reduced the Luft­waffe’s fuel supply by nearly 70 per­cent between April and this date in 1944. Allied intel­li­gence esti­mated that the enemy could lay hands on two million freight cars to move troops and supplies to the in­va­sion front. So to pre­vent the Ger­mans from de­ploying, rein­forcing, and re­supplying their beach­head defenders, Allied air­craft hea­vily bombed and cra­tered French and Bel­gian high­ways, tunnels, river crossings, and rail­road yards. Unfor­tu­nately, civil­ian casual­ties in these air raids, as well as from sabo­tage on the ground, were heavy: 12,000 peo­ple lost their lives. But 80 classi­fi­cation/mar­shalling yards and 1,500 loco­mo­tives were put out of com­mis­sion, along with numer­ous bridges, 36 air­fields, 45 gun bat­teries, and 41 radar instal­la­tions that the enemy would desperately need to throw back the invaders. When the first in­va­sion ships set sail from England on June 4, 1944, and troops finally set foot on Fes­tung Europa (For­tress Europe) two days later, the Allies had neu­tra­lized the Luft­waffe over France (the Ger­mans had less than 160 ser­vice­able air­craft) and degraded the enemy’s ability to move on land. 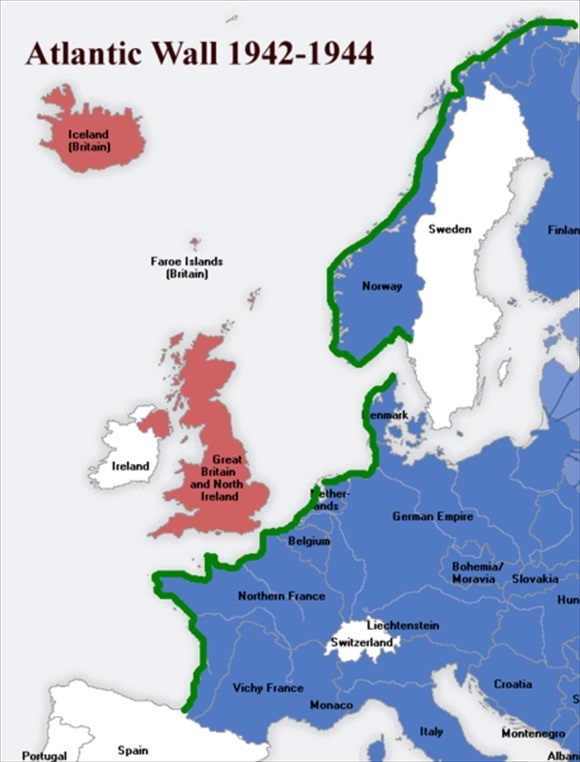 Above: Map of the 1,668-mile-long Atlantic Wall shown in green. The wall hugged the coast­line from Nor­way to Spain in varying degrees and was most elab­o­rate facing the Eng­lish Chan­nel. It con­sisted of an exten­sive system of imposing coastal forti­fi­ca­tions built between 1942 and 1944 as a defense against an anti­ci­pated Allied in­va­sion of the con­ti­nent. In France the wall com­prised a string of rein­forced con­crete pill­boxes along the beaches or some­times slightly inland, as well as mines and anti­tank ob­sta­cles planted on the beaches or in waters just off shore. Left: In November 1943 Field Marshal Erwin Rom­mel took com­mand of Ger­man Army Group B in occu­pied France. He also took con­trol of the Atlantic Wall defenses on the French coast facing Eng­land. In this photo from April 1944, Rom­mel and his officers can be seen in­specting an instal­la­tion of ob­struc­tion beams (Hemm­balken). Some were topped with mines. The Allies modi­fied their origi­nal plans to land troops at high tide, closer to the shore, in favor of landing at low tide when the ob­struc­tions could be seen and avoided. The dis­ad­vantage with the revised plan was that it increased the length of beach to be crossed. 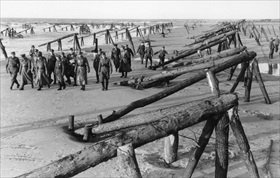 Right: In 1943 German troops had begun using hy­drau­lic pres­sure hoses to assist in planting high wooden poles (Hoch­pfaehlen) in beach sand as ob­stacles to landing craft. 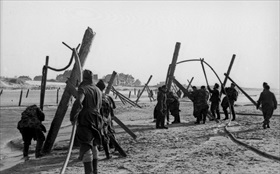 In February 1944, on a tour of Chan­nel beaches in Pas-de-Calais oppo­site Eng­land, Rom­mel ordered the tech­nique used to place wooden beams, metal rails, and other ob­struc­tions along Nor­man­dy’s beaches. Nearly 11,000 were in­stalled on the coastline where the Allies would land. 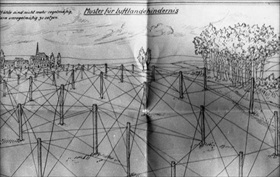 Left: Rommel sent his subordinate com­manders sketches like the one depicted here for laying out wooden log and wire defenses against airborne assaults. Barbed wire and trip­wires were to be strung between the poles. The com­plete system of wooden poles and interconnecting wires was called Luftlandehindernis. 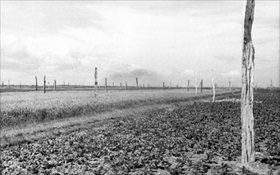 Right: “Rommel’s asparagus” (Rommelspargel) refers specif­ically to wooden poles used against aerial in­va­sion. Wooden tree trunks and logs set in French fields and mea­dows in 1944 were in­tended to cause damage to mili­tary gli­ders and to kill or in­jure glider in­fan­try. Though more than a million of these poles were erected, their effect on the invasion of Normandy was inconsequential.